North Adelaide. SA. If you like to live in a very quite neighbourhood, and also be very close to the city, this is an excellent place to choose. The local area has a range of great pubs and coffee shops. For those looking for a metropolitan lifestyle without all the noise, North Adelaide is one of the quietest around. 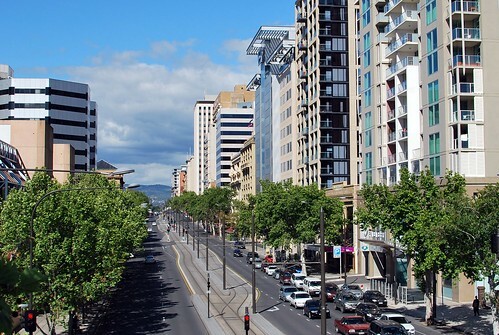 Close to the Zoo and surrounded by park lands, it is a truly wonderful place to live only minutes walk to the University of Adelaide and many of the Arts and culture of the city. Cairns. QLD. If you like the warm weather, golf and a range of outdoor activities both day time and night, Cairns is the place for you. Once a sleepy village it is loaded with tourist from around the world. You wont need too many clothes as it is good weather all year round. With night markets and a great range of restaurants it is a great place to have an international lifestyle at very cheap prices. West End Brisbane. QLD. As with just about every other area of inner city living, the West End of Brisbane was not much to look at not long ago. Now it is a thriving inner city community all of its own highly popular with young and up and coming singles and couples. Loaded with great places to eat and drink it is lively all of the week through. Bondi Beach. NSW. If you like the beach, then Bondi rates up there as one of the best in the world, and it is only minutes from the heart of Sydney, for those of you who need to be around people. Packed with pubs, restaurants and coffee shops there is never a dull moment. Despite being highly populated and a centre for entertainment crime levels are relatively low due to the high levels of police in the area on bike, foot and car. Some will say it is the only place you should live if you are in Sydney. A truly modern Australian suburb with old-school style. Chevron Island. QLD. If you like quiet living but only minutes away from the beach and nearby entertainment districts, Chevron Island is a luxury place to live. With loads of man made and natural canals it can be the perfect place to own and use your own private yacht. Only minutes away from Surfers Paradise but surprisingly quiet and little road traffic due to intelligent road design. Where you live, will greatly effect the way you live. Choosing somewhere that has low crime (greatly effecting your home and contents insurance), good police patrolling, great weather, and places to eat and shop is not difficult in Australia. These are only 5, but there are hundreds to choose from – especially if you love to live by the beach. When you unexpectedly get a financial windfall or time off, a holiday is always a good idea. Late deals are cheaper outside the school holidays, but click here to find out more.